• Where does poop go when you flush? • What’s the secret genius below an outhouse? • Are you eating food grown in your own poop? 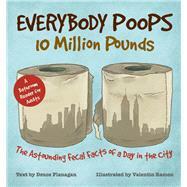 • Can you ride a poop-powered bus? • Was there really a flush toilet 5,000 years ago? • What is the future of poop? Deuce Flanagan is an amateur expert in the sewage sciences. He lives in Oakland, CA.